Welcome to North Scottsdale Children’s Dentistry! Located in Scottsdale, Arizona, we treat patients from the surrounding communities of Fountain Hills, Paradise Valley, Phoenix, Desert Ridge, Care Free, Cave Creek, McCormick Ranch, DC Ranch, Gainey Ranch, and McDowell Mountain Ranch. 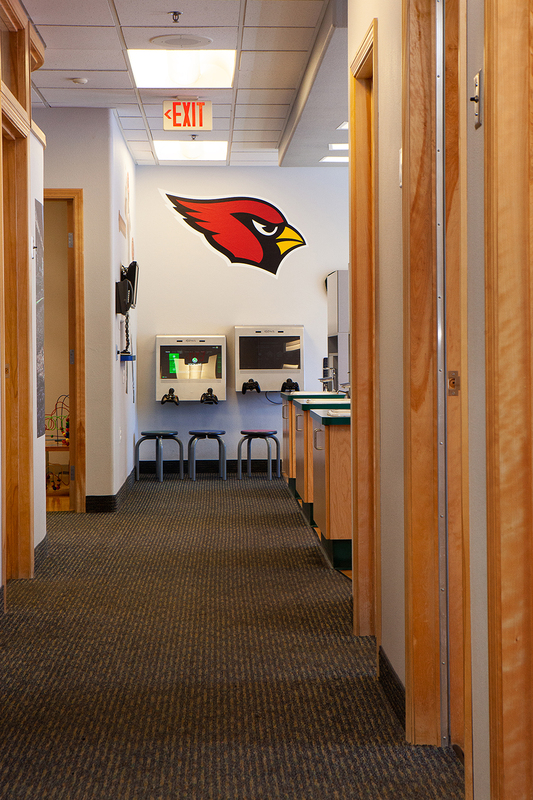 North Scottsdale Children’s Dentistry is an established sports-themed pediatric practice with an orthodontist right next door, so we can work together to deliver the most comprehensive care available for your child. Our goal is to create a dental home for your little ones. Our dedicated team makes sure that every child that visits us feels like a star and we love getting to know our patient’s families. We stress prevention, education, and comprehensive dentistry in a fun, caring manner. Sometimes a child has had a poor dental experience elsewhere or has heard that a trip to the dentist is something to be feared. For these more anxious patients, we offer oral conscious sedation and nitrous oxide. 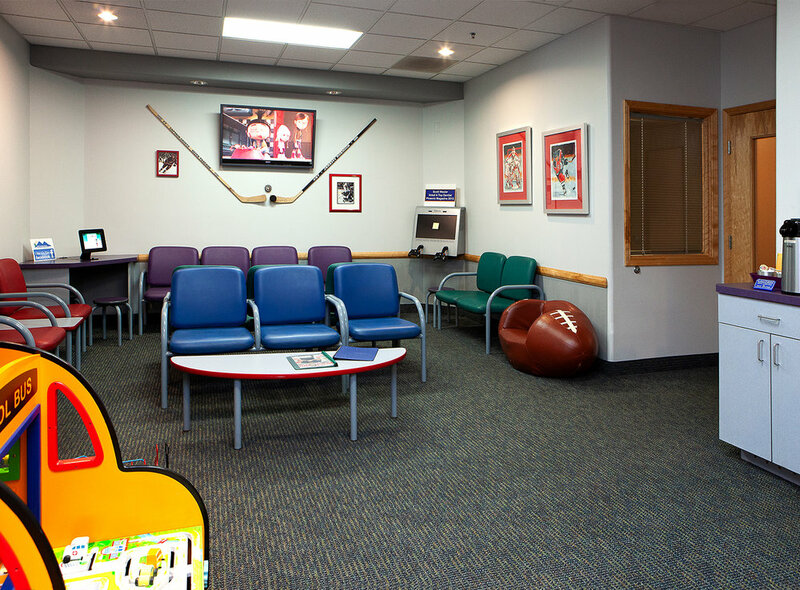 Because your comfort is important to us, we offer many of the modern amenities you’ve come to expect in a children’s dental office including video games, toys, and flat-screen televisions throughout the entire office and on the ceiling of treatment rooms. We believe that whatever your dental needs may be, you will be treated with the highest quality dentistry available and with the most compassionate, respectful care you deserve. Located in Scottsdale, AZ, we are your local, comprehensive dental solution for children from their first tooth through adolescence. North Scottsdale Children’s Dentistry can help your child begin their journey to a healthy, beautiful smile. Periodic dental cleanings keep your dental health on track. Discover the benefits of optimal care & regular check-ups. We share office space with an Orthodontist and the doctors work closely together in regards to patient treatment and care. We treat our patients just like family, setting our patients up for success with a forward-thinking approach to dental care. Here's a few highlights from our public reviews. "We have been going to Dr. Wexler for 11 years now!!! All three of my kids have had a great experience. The office staff is always kind with smiling faces and conversational. Dr. Wexler is kind, patient and gentle. The kids actually love going to see the dentist which establishes good oral health practice for life. The appointments are always on time and efficient." "Dr Wexler and his staff are the best! I called for an after hours urgent issue on a holiday and he called back promptly. They have video games and movies in the waiting room for the kids and the office is always clean. The staff is always so nice! The best children’s dentist in the area for sure!" "Everything in this practice is geared to making dental appointments friendly to kids. Dr. Wexler and her dental assistants were patient and kind. They explained everything to my girl. I love that they are also big on prevention. My girl also loves the goodie bag and the new toothbrush she got to pick out at Dr. Wexler!"